Edanz Group held two free 45-minute seminars on peer review during this year's Peer Review Week: one on 11 September 2017 (How to Peer Review a Paper) and one on 13 September 2017 (How to Write a Peer Review Report). It was encouraging that more than 1000 people registered and about a quarter joined the webinars live. Thank you for your interest, and positive feedback! The recording will be made available to all registrants and will be posted to the Edanz Academy site in due course. Peer review is an important skill and role for all researchers. If we were to estimate how many peer reviewers are needed worldwide in a year for 28,500 English-language journals (assuming each publishes a modest 5 peer-reviewed articles every month, an acceptance rate of 50% after peer review, and 2 reviewers per paper), a conservative number would be 6.8 million--and just for English-medium journals. Many reviewers review more than once per year, but this shows that journals do rely on a constantly refilling pool of reviewers who are willing and able to play their part to help the research community maintain the integrity of the research archive. Early-career researchers often have to rely on their peers and supervisors to provide mentorship in peer review and critical thinking when reading research articles--and any literature presenting evidence or argumentation. A common question that was asked during the two Edanz webinars was how to learn more in the future and get hands-on practice. Holding journal clubs is a good way to practice analyzing articles, as is reading reviewer reports in online journals that provide these (as a form of fully open or transparent review, or "open reports"). Examples are F1000Research, PLOS ONE, some BioMed Central journals, and Royal Society Open Science. These journals also show how the authors responded to the reviewers. (1) Publons Academy (trainees need a mentor). Completing the course allows you to join the Publons platform as a peer reviewer with a graduation badge to show participating journals you are qualified to review for them. (2) American Chemical Society Reviewer Lab (not limited to chemists; certificate is awarded on completion). To mark Peer Review Week 2017, the Committee on Publication Ethics (COPE) publicized free educational resources on best practices in peer review, including revised COPE Ethical Guidelines for Peer Reviewers and a new flowchart on the initial decision to accept a peer review invitation (What to Consider When Asked to Peer Review a Manuscript). Relevant to that flowchart, someone asked in the first Edanz webinar about how to spot a fake journal asking you to review a paper, and what if as an author you submitted a paper to a fake journal. The ThinkCheckSubmit.org checklist is useful for learning how to identify a trustworthy journal, and a Nature viewpoint piece by Kelly Cobey (publications officer at the Ottawa Hospital Research Institute, Canada) contains advice for how to withdraw a paper submitted to an unethical journal (but be warned it may threaten to charge a withdrawal fee). A few attendees at the Edanz webinars commented that learning to read critically and perform peer review would help them learn the style and quality of writing expected for their own research articles. They asked for more free resources to help them write. Some can be found at the Edanz Academy webpage. For example, the free Edanz Author Academy is a complete Moodle course for early-career researchers learning how to write research manuscripts and also has a module on the peer review process. The free Edanz Author Path, which is a secure Cloud-based authoring platform with educational prompts, is another useful way to learn manuscript writing. Peer Review Week 2017 was timed to coincide with the Eighth International Congress on Peer Review and Scientific Publication (10-12 September 2017, in Chicago, USA). The congress takes place every 4 years. Delegates discuss research evidence on aspects of peer review (and post-publication public commenting), trends, and ways to improve peer review. This year's theme was "Transparency in Review", which has multiple meanings, such as clear journal policies, appropriate disclosures, and models of review and commenting. Several organizations and publishers used the week to announce new ventures or report on recently launched initiatives. ORCID is a platform that issues unique identity numbers to researchers and allows them to record their research outputs and also peer review activities. ORCID's update revealed that they have linked up with two major online manuscript and peer review platforms (Clarivate Analytics' ScholarOne and Aries' Editorial Manager). Most ORCID peer review records currently come from Publons, which in turn attempts to help peer reviewers get recognized for their contributions to academia. A related development is that CrossRef now has the full infrastructure in place to allow publishers to assign digital object identifiers (DOIs) to peer review reports and make them publicly available and citable, while allowing peer reviewers to record and gain credit for their work. Meanwhile, BMC Psychology is now offering results-free peer review that would accept-in-principle "registered reports" of study methods and rationale before the study has been done. The aim is to increase reporting transparency and remove the pressure to publish only positive research results, which biases the research archive and reduces reproducibility. More than 70 journals have recently introduced this model. 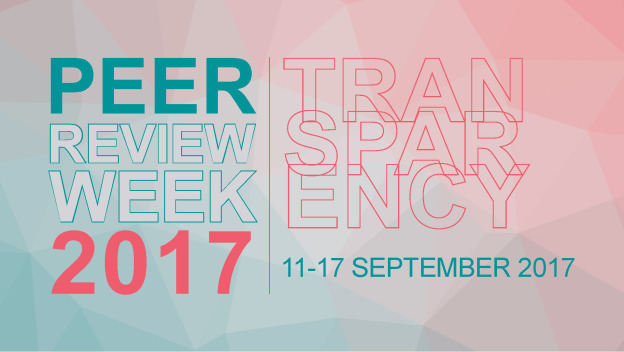 Peer reviewer recognition, research reproducibility, fairness, consistency, trust, objectivity, and training were some common concepts being discussed in blogs and websites during Peer Review Week 2017, and these will no doubt be recurring themes in next year's event. A few attendees of the Edanz peer review webinars asked about the possibility of future webinars on reviewing as well as writing manuscripts. These are indeed being planned, starting with a writing fundamentals webinar on 2 October 2017, 7:00-7:45 pm (Japan Standard Time). Register here to attend and/or receive the recording. I look forward to meeting you online at a future webinar! Note: Edanz Group is a corporate associate member of COPE, and Dr Trevor Lane is an individual associate member and Council Member of COPE; he peer reviewed the Publons Academy peer review course during its development. COPE is a founding and contributing organization of Think. Check. Submit. Edanz Group contributed to some of the checklist translations on the Think. Check. Submit website.